Ell Clough Ring Cairn on the lower slope of Boulsworth Hill. OS grid reference: SD 9019 3412. 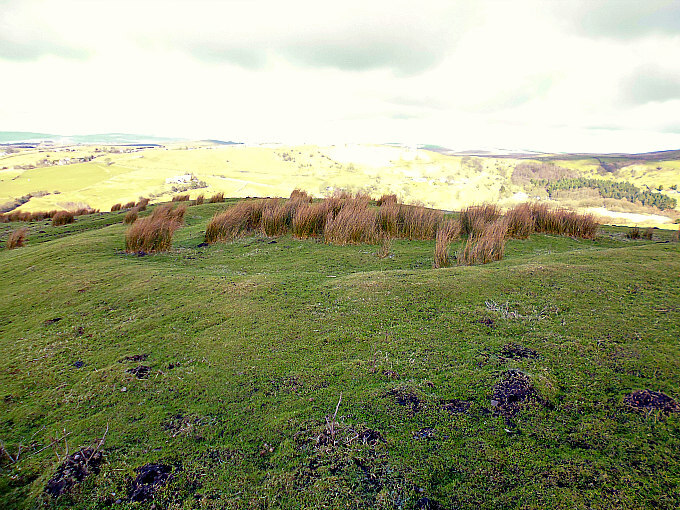 The Ell Clough (Hell Clough) cairn circle, ring cairn and burial mound, is located on the side of Boulsworth Hill, in Lancashire – with commanding panoramic views over Thursden Valley and, in the distance Pendle Hill. It is named after the nearby stream which runs down slope through Ell Clough. At the junction of three lanes in Thursden Valley walk up the signposted footpath right to the very top of the hill and then via right along the trackway to reach the tumulus, which is located just where the track curves around the ancient site. A little further along the track there is a second tumulus, although this one is now hardly recognizable at ground level. The village of Trawden is 3 miles to the west. This tumulus is in a reasonably good condition although the small inner mound has suffered from being disturbed by excavations and other things, and the outer circle of stones has long since gone to nearby walls, but the circular earthworks of this ring cairn are still very well-defined despite the ravages of time and the weather conditions upon the bleak, windswept hillside of Boulsworth – some 350 metres above Thursden Valley. Ell Clough Ring Cairn on Boulsworth Hill. In 1886 Archaeological excavations took place here and these yielded a mid to late Bronze-Age funery urn. It would seem that originally there were seven standing stones in the outer circular bank, but these have long since gone. There are four stones on the banking but these are not the original ones. Sadly the stones were robbed away to build field walls. The monument measures approximately 19m diagonally by 17m across. The outer bank is still quite substantial as is the inner ditch which would originally have been quite deep; while at the SE side there is what could be an entrance or maybe damage. The small ‘denuded mound’ near the centre originally contained the burials as a funery urn was excavated from here back in 1886. This measured 12 inches x 10 inches and had a 4″ base and was carved with various patterns. An adult and a child’s remains were found in the urn and also a few other artefacts including a Bronze pin. It is of interest here to note that the monument seems to be aligned with Broadbank Earth Circle, Walton Spire and Pendle Hill, or is this just a coincidence? Some 100 metres to the north and close by the trackway (Os grid ref: SD 9027 3412) there is another tumulus that is similar in size, however this is now hardly recognizable “as such” at ground level. There is just a trace of a circular earthwork and possible ditch. 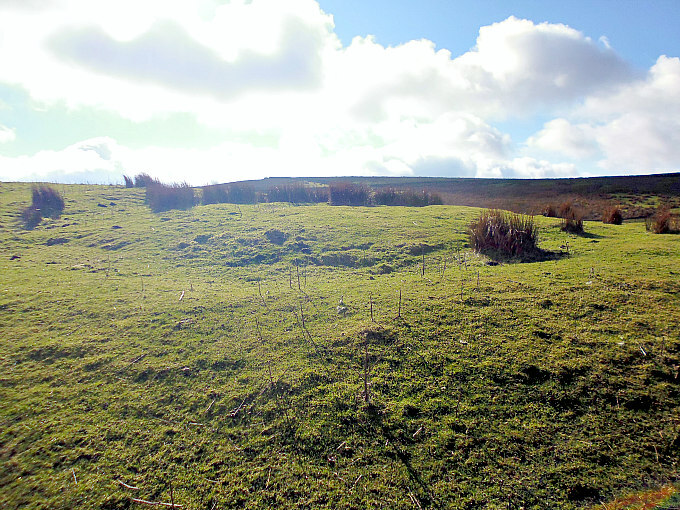 And there is a third tumulus some 240m to the north-west at (Os grid ref: SD 9051 3421). This is located on the bank beside a stream but once again it is very faint and hardly recognizable at ground-level. Bennett, W., The History Of Marsden And Nelson, Nelson Corporation, Nelson, Lancashire, 1946 & 1957. 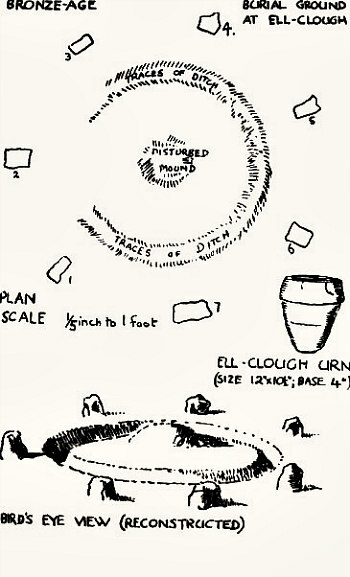 Diagram of Ell Clough by Mr Jack Wilcock. Categories: Burial Mound, Cairn / Cairn Circle, Ring Cairn | Tags: Ell Clough Cairn Circle on Boulsworth Hill in Lancashire | Permalink.